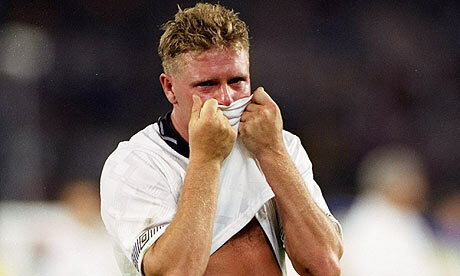 The last time I cried after a soccer game was when I was 13 and I let in a soft late goal in a 3-2 loss to our hated rivals. Until today. 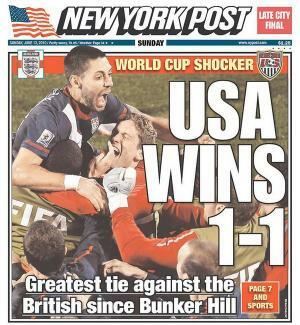 Until the U.S. improbably topped the group after (not improbably) leaving it late to beat Algeria 1-0 in the World Cup. Those assholes in Red, White and Blue are taking years off my life with these cardiac event-inducing performances. 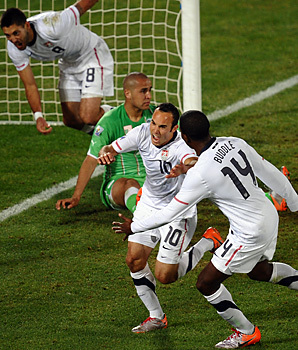 Though, when Landon Donovan slotted home the loose ball in injury time, he may have saved me from getting in my car and driving off a cliff. And, this stalwart U.S. team, ultimately gave me a sporting memory I’ll never forget. Analysis, at this juncture, seems superfluous. Anyone who suffered through those 90+ scoreless minutes wouldn’t quibble with the effort, the only lingering memory beyond Donovan’s goal being the Americans inability to finish. Kudos must be handed out, however. To Jozy Altidore, who has beeen immense the last 180 minutes, his skied sitter notwithstanding. He has learned much at Hull; his hold-up play is top-notch, his patience is vastly improved and his ability to get into dangerous spots, while not yet translating into goals in his account, has opened up lanes for others to exploit. 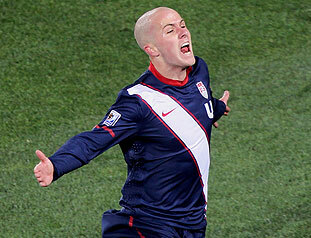 To Michael Bradley, who has tamed his baser instincts (chiefly, the urge to chase the ball and dive into tackles he has no hope of winning) and been a calm and persistent presence in midfield. While he is not yet a distributor who can carve up defenses, he has been far more composed on the ball and kept his giveaways to a minimum. To Jonathan Bornstein. I had a moment of sheer panic this ayem when I saw he was in the Starting XI. He’s been abject for six months. But this was a masterstroke from Coach Bob Bradley. Algeria’s set-up and approach virtually ensured Bornstein’s defensive responsibilities would be minimal and the Chivas USA player was in to try to get forward and exploit Algeria on the flanks. It didn’t exactly happen that way, but the change did strengthen the back line, with the Bocanegra/DeMerit pairing yielding excellent results compared to the previous two games. To Clint Dempsey’s tireless work. He could have had three (and did, in fact, have one), but he kept his head and his run helped crate the game-winner. To Bob Bradley who has fashioned a team to be admired. Not nearly a top-20 team in terms of skill, but maybe #1 in the world in terms of Team. Captial T. Their belief and spirit is remarkable. And to Landon Donovan, who was largely absent most of the night, but who put the g.d. ball into the g.d. net and remains one of our country’s most approachable and likeable sportsmen. As the de facto figurehead of U.S. soccer, we can wish for no finer ambassador. The Round of 16 awaits. For now, I’ll relish the next 72 hours until I will live and die with them again. My most favorite memory, well beyond the end of this tournament, will be that I watched this game with my 8-year-old son, AJ. It’s rare he’ll sit through and entire sporting event, but not only was he riveted by the action, he was emotionally invested. 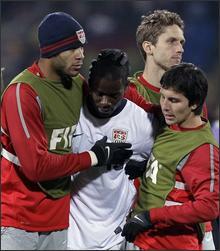 He cried, too, ’round the 82nd minute when it seemed all those missed chances would be the 2010 epitaph for this U.S. team. When the ball hit the back of the net, I leaped in the air, screaming, “It’s in! It’s in!” My son jumped into my arms, we hugged, rolled on the living room floor and shared the moment. Thank you for that, U.S.A.